Ever since he presented on the ‘Google Rails Clone’ at FooCamp and he posted about the internal Google Rhino on Rails project, people have been curious to learn more. Rails = a group of Active*, so did you re-implement everything? What is the state of Rhino? When do I get to see it! I happen to be in Seattle at the Google offices, so I was able to ask all of these questions and more. Steve was a fantastic host, and I really enjoyed chatting with him. This is the kind of video I want to explore at Google. We have many great developers working on cool technology. I want to get them on camera, participating with the community when I can. Sometimes we can talk about products and APIs, but sometimes we will talk about fun ideas and projects that we are working on such as Rhino on Rails. Seriously though, very cool, I’m definitely going to check this out. As always, it has to do less with the language, and more with how skilled the programmer is with the language. I don’t agree with your statement. Yes, a programmers skill does make a big difference no matter what language you use – but every language also has its advantages and weaknesses just as much as every programmer does. Great programmer + great language = maximum results. It was quite amusing when Steve mentioned using GWT for the server side. @sentientholon, good call… the term Ajax wasn’t coined until 2005, though the infrastructure to do it (esp. XMLHttpRequest) began in 2000 [according to Wikipedia]. Took a while to get the buzz/hype. I guess you mean “full OOP” but… what’s that anyway? What makes some people think that prototype-based OO is any less complete than class-based OO or that it lacks something? Even more on this, why do people associate the second with “just OO”? 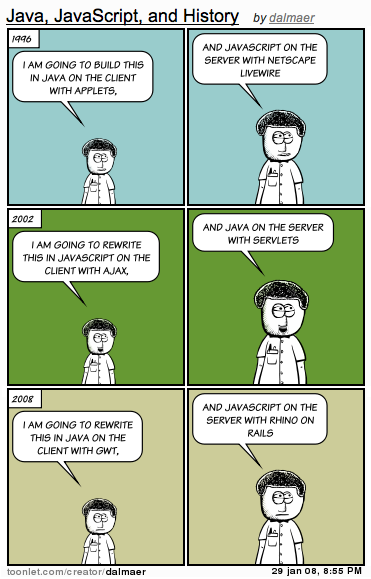 Fully fledged Ajax writing nothing else than C# and “standard” ASP.NET.